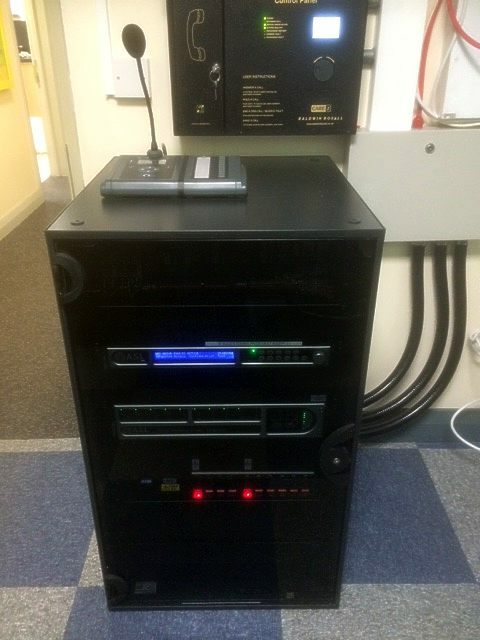 We have just completed the upgrade of the voice alarm equipment at Mersey Rail’s Conway Park Station in Birkenhead. The works, carried out for MP Electronic Fire & Security Ltd, consisted of replacing the existing faulty voice alarm control equipment and the emergency telephone system. Both of the systems were housed in the same 47U high equipment rack along with the stations fire alarm system. We opted for an Application Solutions Vipedia 12 system. First of all this is EN54 compliant equipment and in addition carry’s Network Rail approval. ASL’s Vipedia-12 provides audio routing from 12 analogue audio inputs plus 2 IP inputs to 12 analogue audio outputs plus 2 IP outputs. The device also includes provision for 64 internally stored digital voice announcement messages. A full range of 24bit/48kHz on-board digital signal processing is also available. The 2U high V2000 mainframe houses eight 150W amplifier channels to provide 150W A & B circuits for the stations four zones; Ticket Office; Platform 1; Platform 2; and the Concourse area. In addition to the eight ‘Duty’ amplifiers a 150W ‘Standby’ amplifier is also housed within the frame. The mainframe also incorporates loudspeaker line surveillance modules, which in this instance employs impedance monitoring. The original Atlas Soundolier system used two wire radial circuits to link the central panel to six remote telephone units. To save cost it was decided to retain the site cabling if at all possible. Hence any replacement system would need to operate on radial circuits. Consequently we selected Baldwin Boxall’s Care2 system which has proved to be the ideal solution. Most of all it has yielded a huge improvement in audio quality.